These apps not only make it easier for consumers to find their dream unit, but also significantly expand the online marketplace for powersports sellers. 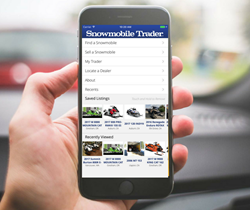 Cycle Trader, a division of Dominion Enterprises, has released the Snowmobile Trader and PWC Trader apps to complement its industry-leading sites. Available on iTunes and Google Play, these new powersports apps enhance the mobile buying experience by allowing more than 250,000 monthly buyers already on mobile devices an easy-to-use application to search for their next unit, no matter what device they may be using. Following a sturdy iOS and Android presence of the Cycle Trader app for over five years, as well as a successful ATV Trader app launch in 2016, the new additions round out the Cycle Trader portfolio of mobile apps catering to consumers looking for their next powersports vehicle. The Cycle Trader suite of apps makes it easy for users to browse geo-located search results, save searches and keep track of vehicles they are interested in, all from the ease of their homescreen. Users can also calculate payments and compare shipping options, further helping them determine the unit and dealer that best fit their needs. Other applications in the company’s powersports portfolio include the Cycle Trader and ATV Trader apps. Cycle Trader, a division of Dominion Enterprises, is composed of a unique portfolio of classifieds sites, including Cycle Trader, ATV Trader, PWC Trader, and Snowmobile Trader. With more than 400,000 new and pre-owned units available from dealers and private sellers, these sites connect millions of active powersports buyers to sellers across the country. Cycle Trader offers sellers a comprehensive suite of digital marketing solutions to help them advertise their inventory across all devices. Dominion Enterprises is a leading online marketing and software services company offering client solutions across multiple targeted business verticals. Our widely recognized B2C web and mobile portals, including ForRent.com, Homes.com, CycleTrader.com and BoatTrader.com, generate nearly 30 million unique visits monthly. Our B2B cloud SaaS solutions directly support clients in establishing their online and mobile brands, generating leads, and managing customer relationships. Dominion Enterprises has more than 40 businesses and 3,000 employees in our Norfolk, Va. home office and across the U.S.